In practice, this means that Sadie has thrown herself into her job. Without Lars, Sadie’s frustration with work has only grown. His presence meant that, even in the doldrums of restocking doughnuts, cleaning up, and running through employee safety videos, their workplace was still a Lars and Sadie space—they were in it together. Now, it’s just Sadie, working around the clock to keep The Big Donut in business. (By the way, do we know who owns The Big Donut? This might be a dumb question but I genuinely don’t think I know who Lars and Sadie’s boss is supposed to be. Is it a franchise?) She’s got bags under her eyes, she’s picking up every shift the store has, and she’s literally talking to herself in Lars’ voice. Kate Micucci is fantastic throughout the episode, but this is a real highlight—hearing Sadie’s good-natured, but sharp Lars impression when she says “Oh come on Sadie, you missed a spot” before immediately turning on a dime to a meeker, more traditional Sadie apology. Into this sad situation, storyboard artists and writers Lamar Abrams and Jeff Liu (who briefly appear in a cameo leaving The Big Donut at the beginning of the episode) introduce Sadie’s new friends: Buck, Jenny, and Sour Cream. (And Steven!) The foursome have been scheduling a lot of jam sessions for their new band, and struggling over what to pick as their sound. Steven wants a peppy, non-threatening, clean band sound, which clashes with Buck’s desire for provocative lyrics that Jenny characterizes as “waking people up inside,” which is absolutely, positively a reference to the classic Evanescence single “Bring Me To Life.” (Please do not try to tell me otherwise, thanks.) Sour Cream, ever the audiophile, wants to make sure that the music is challenging, since you “can’t let your audience get too comfortable”—a goal that is directly counter to Jenny’s concern for the listeners being able to dance. In short: It’s a band! Sadie is, of course, the missing ingredient, as the band discovers when they bring band practice to her house by following her home from work. Sadie’s basement pad is a perfect venue for Steven Universe’s ongoing exploration of the tropes of teen rock rebellion, which last got a substantial workout in “Last One Out Of Beach City.” Her room is full of cult classic movies, weird clothing, and now band equipment, providing fertile soil for Sadie to blossom into the badass she was always meant to be. In one spontaneous burst of creativity, the new band comes together to write their new song: “The Working Dead,” a “Monster Mash”-evoking lurch that moves outward from the kernel of “We Are The Crystal Gems.” This entire sequence is really phenomenally done by Abrams and Liu, with everything from the subtle fuzzed-out quality of The Lurch clips playing behind the band to the pristine shot of Buck’s unmoving face, his visor reflecting the film back at us, adding to the sense that there’s an entire music video and aesthetic vibe being created here. Well, it looks like there really is no character on Steven Universe who’s so terrible they can’t be redeemed, even if it’s only a little bit. Kevin is still an awful person, but “Kevin Party” puts him into a vaguely sympathetic role as he tries to get Steven and Connie back together so he can have Stevonnie make an appearance at his party. (Also, it turns out that he had his heart broken by someone named Sabina, which makes him a pretty typical insecure rich kid trying his best to appear above it all.) It’s tough to make this episode, which from the beginning telegraphs the resolution of the Steven-Connie conflict, feel like more than a necessary step on the show’s overall emotional path, but storyboard artists and writers Amber Cragg and Hilary Florido do a pretty solid job of making Kevin’s party a lot of fun, too. Mostly, that comes in the smaller moments of the episode, like the posters Steven is busy putting up around town looking for information on Lion (who is, presumably, missing along with Connie). But there’s also way that Kevin screeches back with his car to make sure Steven has the details about the party (seriously, how do people on TV know where to go otherwise? ), and that that phone is a BlackBerry with a track ball, because of course Kevin has a BlackBerry. And there are all of the disaffected, cool teens who seem to be having a very fun and very bad time at the party, all at once—including former Steven Universe writers Ben Levin and Matt Burnett, who spend the episode sitting coolly by the pool. Notably, they do sort of have a fun time eventually, drinking Sugar Shock Shut Down and dancing like crazy. (Also, even Kevin, the absolute slimiest, worst person on Steven Universe short of Marrty, doesn’t misgender Stevonnie.) He’s right: “No one turns down an invitation to a Kevin party.” He’s also right about his scarves: “When you put on a scarf like this, it’s always cool.” Andrew Kishing is, as always, delightful as Kevin, allowing his natural sleaziness to mix with just a tinge of sadness and paternal feeling toward Steven (sorry, Clarence). Truly, this is the best party in Del Marva. Eventually, Steven and Connie do have their conversation, prompted by Connie get increasingly angry at Steven for ignoring her at the party. 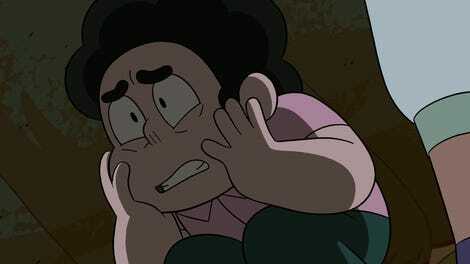 As in most cases of this kind of non-communication, there’s a decently reasonable explanation for Connie’s ongoing silence that makes way more sense in context—notably, that texting Steven would have broken her self-imposed rule of not wanting to talk to him while she worked through her feelings. And then when she wanted to talk in person, she just assumed he’d been on vacation after visiting the Temple during “Gemcation.” Connie’s absence has felt like a huge negative presence, which is what happens when someone is absent from your life for a while, but Grace Rolek brings the same immediacy and emotional clarity to Connie that we’ve come to expect, and her side of the story makes absolute sense. Thankfully, Steven’s apology goes down smoothly, and the pair manage to make up and ride off on Lion, without forming Stevonnie. It would be kind of a cheat to do it for Kevin, right? At least he got some fireworks at his party. And good news! There are some more fireworks coming our way in 2018, with new episodes of Steven Universe coming next week—which means we don’t have to wait nearly as long for the start of the next arc. See you next Friday for two episodes of a Lars and Stevonnie adventure.